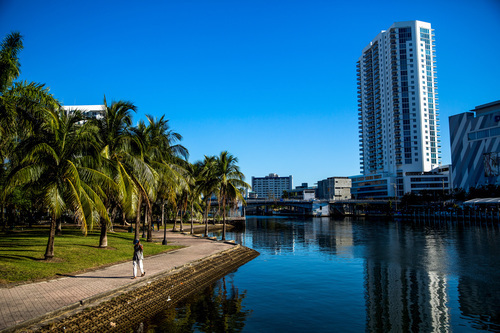 Jose Marti Park is a 13-acre hub of activity for East Little Havana, the Miami River waterfront area, and other adjacent communities, many of which are low income. With a host of amenities, including a riverwalk, community center, baseball field, playground, swimming pool, outdoor fitness equipment, and basketball complex, the Park is often bustling with activity. Yet the Park experiences flooding from both the Miami River during high tides and from rainstorms due to its topography and lack of drainage features. For these reasons, the Park is emblematic of the challenges that river conditions present to communities throughout the South Florida region and other low-lying coastal areas. A portion of the Park also lies in the shadow of an I-95 overpass and presents an opportunity to demonstrate how public spaces in underpass areas can be better utilized to serve the community. On January 24, 2019, the Van Alen Institute and the City of Miami, Florida released a Request for Qualifications (RFQ) for the climate-adaptive redesign of Jose Marti Park. Van Alen’s introduction of climate adaptation to the project scope solidified the City’s commitment of $940,000 to the budget for the early phases of the redesign. The Jose Marti Park project is part of Keeping Current: A Sea Level Rise Challenge for Greater Miami, Van Alen’s multi-year inquiry into how cities and communities can use design as a catalyst for adapting to climate change. “By involving the people who live here in the design process and incorporating resilience, this project will both protect and engage people as it showcases creative design strategies,” says Van Alen Institute’s Director of Strategic Initiatives Jessica Lax. Through this RFQ, Van Alen and the City seek to commission a multi-disciplinary design team for the project that offers the full range of professional urban design, landscape architecture, and engineering services and includes at least one Florida-licensed firm. The design team will work with Van Alen Institute and the City to ensure that this treasured public space serves the present and future needs of the Little Havana community. Another aim of the project is that the solution not only be implemented in Jose Marti Park but also serve as a model to be replicated in other places with similar conditions. The City has structured the solicitation to allow for future design development and implementation phases with additional funding. In addition to reframing the RFQ to include climate adaptation and inviting the design community worldwide to submit qualifications, Van Alen Institute is leading the community engagement process in Miami through schematic design development. To this end, Van Alen assembled and hired a local Project Outreach Team in the spring of 2018 to identify the needs of park users. This group will ensure that the project reflects communities’ goals and interests in the project by administering surveys and helping to plan, facilitate, and promote community engagement events once a design team is awarded. The publication Keeping Current: A Sea Level Rise Challenge for Greater Miami is a project of Van Alen Institute that encompasses a series of initiatives seeking innovative solutions to protect South Florida’s 6 million residents from the potentially catastrophic consequences of sea level rise. To fund the initiative, Van Alen raised $850,000 from The Rockefeller Foundation, The John S. and James L. Knight Foundation, The Kresge Foundation, The Miami Foundation, Target, and Terra. Submissions are due to the City’s procurement office on February 27, 2019. Download the RFQ solicitation documents and learn how to prepare a submission. Download the Keeping Current Resource Guide (PDF).